Jet Fresh Flower Distributors is now supplying more fresh-cut greenery for wholesale, weddings and events. Located near the Miami International Airport, the importer and distributor of fresh-cut flowers, greenery and preserved flowers has increased inventory of fresh-cut greenery to support the ever-growing demand for greenery and fillers for weddings and events. Our new Miami warehouse is now storing a larger amount of greenery and fillers by the box, and our Cash and Carry flower market has even more varieties of greenery available by the stem or bunch to support your wholesale and event needs. 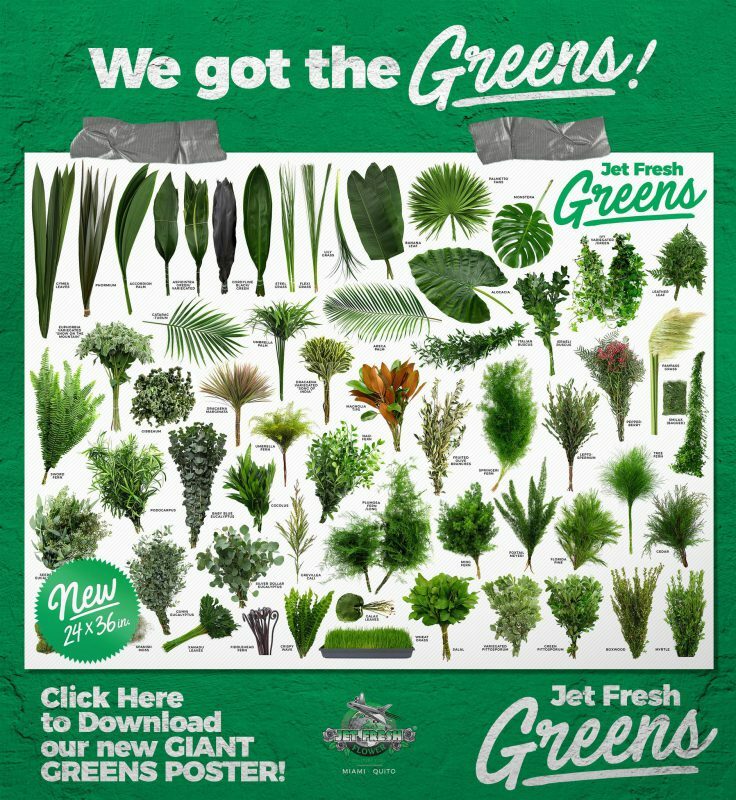 The new greenery poster from Jet Fresh Flower Distributors is now available for download. This collection includes some of the varieties of greenery and fillers that are available to order from us, but aren’t limited to. Download here. Since Jet Fresh Flower Distributors relocated last June to a larger facility across the street, it has provided the opportunity to increase inventory, supplying more fresh-cut greenery as once. This allows our customers to order much more efficiently, getting flowers and greenery from one top source. Jet Fresh Flowers has always supplied fresh-cut greenery for wholesale and events, including our popular Designer’s Dream Mix from Peru —which really is a designer’s dream, filled with many different varieties of greenery in just one pack. For more information about fresh-cut greenery from Jet Fresh Flower Distributors, please contact Sales@JetFreshFlowers.com. This entry was posted in News and tagged designer, download, fillers, Florist, greenery, greens, poster.